You tell lies thinkin' I can't see. You can't cry 'cause you're laughin' at me. How can you laugh when you know I'm down? How can you laugh know I'm down? Man buys ring, woman throws it away. We're all alone and there's nobody else. She'll still moan, "Keep your hands to yourself!" Oh, yeah, yeah, yeah, yeah, yeah. 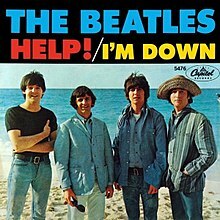 "I'm Down" is a song by the Beatles written by Paul McCartney (credited to Lennon–McCartney) and first released as the B-side to the single "Help!" in 1965. ©1965 Sony/ATV Music Publishing LLC. All rights reserved. Used by permission. As a 5 year old, I thought this was scary as all get-out yet very cool. Still very cool. I love this one.